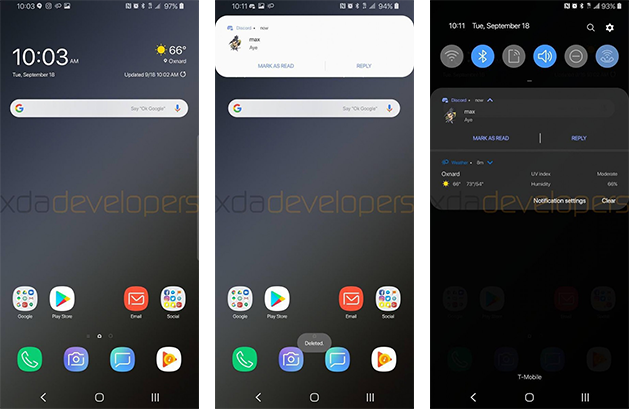 The night theme — which was permanently enabled in this slightly broken build — is supported by the majority of Samsung apps, and can be manually enabled, scheduled, or set to come on automatically when in the dark. The new gesture control, meanwhile, is a tad underwhelming. Rather than anything approximating the gestures built into Android Pie, Samsung just lets you swipe up to the home, back and recents buttons. Perhaps this feels like more of a significant change than it looks, but that doesn't seem likely. More exciting is a new motion — lift to wake, which will wake your phone when you pick it up. Both can be found in a new motions and gestures menu. In terms of design, Samsung picked up some very Pixel-like design elements, including a lot of curved-edge, white space-heavy cards. There are also now rounded buttons in the settings and notifications shade, and the lock screen has the time closer to the center. Plus, the camera got a UI overhaul, with a new toggle front-and-center that switches between a tree and flower icon, presumably for macro versus micro shooting. Those who don't mind taking the risk of installing an experimental build on their device can find instructions on how to nab this software here. The fact that a functioning build of Android Pie for the S9+ already exists, though, suggests you won't have to wait too long for the official builds to roll out. Find the full, in-depth hands-on with Android Pie and Samsung Experience 10 in the source link below.